There has been considerable concern amongst livestock producers regarding recent outbreaks of subterranean clover red leaf syndrome. 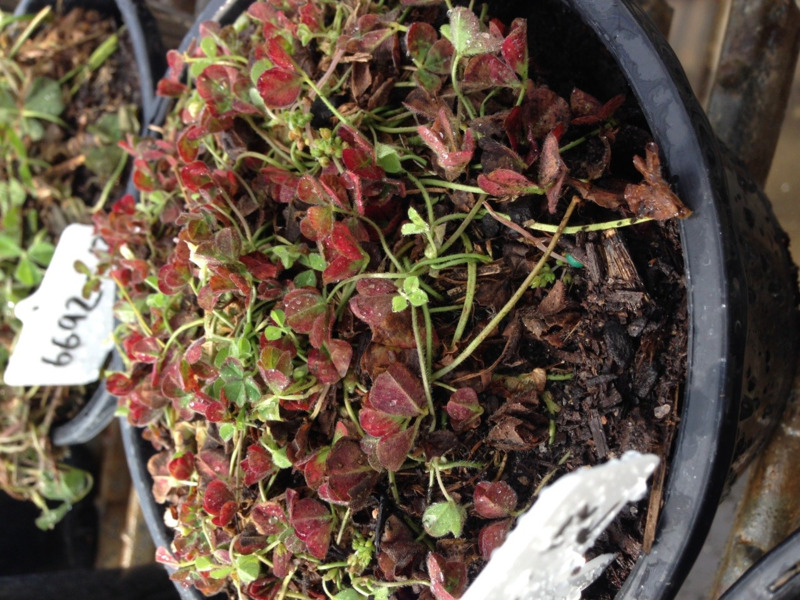 Symptoms include red leaves; stunted plants and even premature plant death. The Department of Primary Industries and Regional Development (DPIRD) investigated the 2017 outbreak, finding that of the subterranean clover plants tested 80% with obvious red leaves were infected with soybean dwarf virus (SbDV) compared to just 2% without obvious symptoms. A detailed SbDV factsheet is now available to help livestock producers identify and manage the impacts of subterranean clover red leaf syndrome. The publication is a result of a collaboration between DPIRD, University of Western Australia, Australian Wool Innovation and Meat & Livestock Australia. It includes mapping of areas that have tested positive for SbDV and more information on survival of SbDV in green-bridge hosts, aphid vectors and management. SbDV is spread by aphids persistently (once acquired the aphid has it for life) and frequently infects subterranean clover. Its incidence in a subterranean clover pasture will vary from season to season depending on the abundance and distribution of alternative plant hosts and aphid vector species. 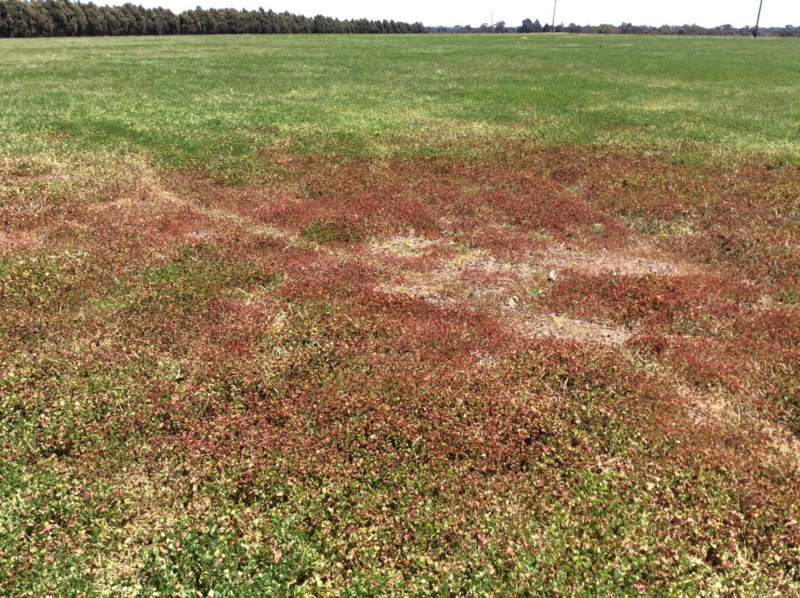 The symptoms can occur as isolated patches in paddocks, to whole paddocks being affected. However, the presence of red-leaves in itself does not necessary indicate viruses are present. SbDV is not seed-borne and therefore is not present in the seed bank or purchased seed. Subterranean clover (Trifolium subterraneum L.) is the most widely used annual pasture legume in Western Australia with around eight million hectares sown. As a consequence there has been considerable concern amongst livestock producers regarding recent outbreaks of subterranean clover red leaf syndrome, the occurrence of which seems to becoming more frequent and widespread. Symptoms include reddening of leaves, stunted plants and even premature plant death causing significant losses in dry matter and seed production. The degree to which symptoms are expressed is related to overall plant health so additional stresses such as drought, poor nutrition or root rots can weaken the plant further and cause the symptoms to be more severe. In response to livestock producers concerns DPIRD and the University of Western Australia (UWA) investigated the 2017 outbreak. The DPIRD laboratory found that 80% of clover plants with obvious red leaves tested were infected with soybean dwarf virus (SbDV) compared to just 2% of ‘healthy looking’ plants. SbDV, formerly known as subterranean clover red leaf virus, was first reported in Victoria in 1965 in clover plants with red leaves, it was subsequently found in Tasmania, New South Wales and South Australia. It has been known to occur in WA since the 1970s. Reports in southern Australia on subterranean clover red leaf syndrome during 1970-1980s found high virus incidence leading to reduced herbage and growth (60%), losses in seed yield (60%), decreased hay production (50%), establishment failure with early infection and pasture collapse. There is also an increased susceptibility to fungal pathogens and change in pasture composition as the infected plants are out-competed by plants which are unaffected. SbDV infection causes leaf margin reddening of older leaves of subterranean clover plants. Plants infected early exhibit more severe symptoms that those infected late, and are often stunted with small leaves and produce few seeds (Figure 1). The type and severity of leaf symptoms differ depending on plant age at infection and environmental conditions. In subterranean clover, SbDV symptoms can be confused with those caused by nutrient deficiencies (especially phosphorous), water-logging, cold or other plant stresses that cause leaf reddening. In some cases, SbDV infection coincides with secondary infection by fungal root rots which can increase the severity of symptoms and contribute towards plant death through loss. This results in environmental stress (for example, reduced uptake of water and nutrients, poor nodulation). SbDV predominantly infects legume species and does not infect grasses. SbDV is hosted by live plants over summer and spread to subterranean clover pasture plants by aphids, but it is not seed-borne. Depending on the location, legume crop (for example, narrow-leafed lupin, field pea, faba bean) volunteers, subterranean clover white clover, red clover, strawberry clover and medics are likely over-summer hosts in WA. DPIRD and UWA are currently investigating other broad-leafed summer weeds as SbDV hosts in WA. SbDV is transmitted persistently, that is, when an aphid feeds on the sap of an infected plant it acquires the virus permanently, but does not pass it on to offspring. When the infective aphid then probes the sap of a healthy plant it infects the plant and continues transmitting SbDV for the rest of its life. The virus only infects cells associated with transporting sugars around the plant – and is not present in any other tissues. SbDV is transmitted by certain aphid species that migrate from green-bridge hosts to colonise subterranean clover. Foxglove aphid (Aulacorthum solani) and pea aphid (Acyrthosiphon pisum) are the primary vectors. Blue green aphid (Acyrthosiphon kondoi) may act as an inefficient vector. SbDV and related viruses generally reach epidemic proportions in pastures and crops in south-west WA when late-summer and early-autumn rainfall favour ‘green bridge’ development. When this occurs, aphids build up under the warm conditions and spread the virus to more vulnerable establishing pastures. In these scenarios, the risk of significant losses in biomass and sudden death is higher. Dry springs favour aphid activity and the development of symptoms. However, aphid numbers are kept down in years with cold wet weather or the presence of aphid parasites. Due to the reliance on pre-season rainfall, and the increased presence of its external hosts and aphid vector species, SbDV is more common in medium to high rainfall areas. If you suspect SbDV is infecting your subterranean clover pasture, collect leaf samples of symptomatic plants and send to DPIRD diagnostic laboratory service for an accurate diagnosis. There are other diseases and factors that can affect subterranean clover and an accurate diagnosis is important so as to target the most appropriate management strategy. Although aphids can be difficult to find on pasture plants using yellow insect traps to monitor their movement is a good early warning tool. Use insecticides only when the risk of early infection is high: Application of an anti-feed insecticide (that is, synthetic pyrethroid) at the highest registered rate for aphid control in subterranean clover at two and six weeks after seedling emergence. This will deter aphids from feeding and therefore spreading SbDV to young vulnerable sub-clover plants. Refer to the insecticide label for withholding periods or Safemeat for export intervals. Manipulate pasture composition: Grasses do not host SbDV so using annual ryegrass or forage oats could be a useful tactic and in the absence of an outbreak would most likely improve early feed availability. Growing alternative pasture species: This is another method to lessen the impact of a devastating loss of subterranean clover as the result of an outbreak. If sowing alternative pasture species, seek further advice to be certain they are suited to your soils, rainfall and management. Serradella is an option as it does not appear to be affected by the syndrome even when growing alongside symptomatic subterranean clover plants. However, a note of caution, it is unknown whether some of the alternative pasture species are hosts of SbDV. Barrier: Oats can be sown as a barrier around pasture paddocks to disperse aphids and slow early spread into pasture from outside sources. This work is supported by DPIRD and UWA with funding from Australian Wool Innovation and Meat livestock Australia. A joint initiative between Australian Wool Innovation and Meat and Livestock Australia to continue to host an online producer survey into the 2018 season will enable producers to report incidents of the virus and allow for sample testing to continue.